A few weeks ago I went to AppSense training. It was very good, very informative and very intense - 5 days were not enough to be honest as it covers all 4 components of DesktopNow (AppSense Management Console, Performance Manager, Environment Manager, and Application Manager). Failed to poll Now : Not enough server storage is available to process this command. "This issue may occur if the IRPStackSize registry entry on the server is set too low." The IRPStackSize parameter specifies the number of stack locations in I/O request packets (IRPs) that are used by Windows 2000 Server, by Windows Server 2003, and by Windows XP. You may have to increase this number for certain transports, for media access control (MAC) drivers, or for file system drivers. Each stack uses 36 bytes of memory for each receive buffer. The IRPStackSize is a parameter that specifies the number of stack locations in I/O request packets (IRPs) that are used by the operating system. Each stack uses 36 bytes of memory for each receive buffer and you can increase the IRPStackSize, through the Windows registry for some transports, media access control (MAC) drivers, or for file system drivers. The default value of the IRPStackSize parameter is 15. 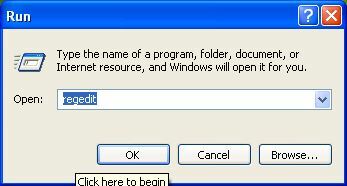 On my Windows 7 PC, for whatever reason, it was set to 10. I creaded it to 20 and have not had an issue anymore. Okay, that's it - I don't really understand the cause ( T___T~) But to make it simple, it is because of the value specified in IRPStackSize parameter, which is too low. Perhaps if the value is too low, it caused the stack size to be limited, and file system cannot handle the request. My wild guess, do not quote me on that! Receive error when to perform Poll Now in ApPSense AMC. A DWORD registry parameter with the name of 'IRPStackSize' is not available. Or if it is available, the value set is too small. Rename it to below name. make sure to follow exactly the same, as it is case-sensitive. 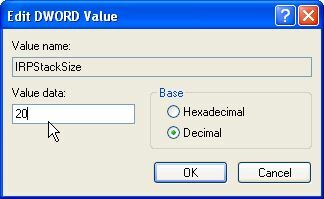 Ensure the base changed to Decimal first before entering the value. The value should be 20 (or 14 in Hexadecimal). Try to perform 'Poll Now' again once the machine came up from reboot. It should be working by now.